This is an example of the sum really exceeding the parts. 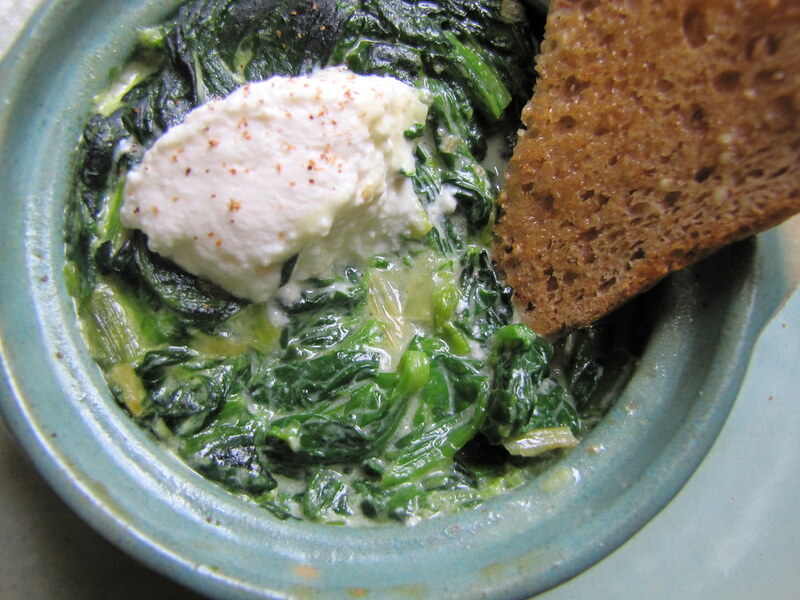 There are so few parts to this, too — sweet winter spinach, creamy ricotta, buttered toast, a tinge of fresh nutmeg and hint of green onion. But combined in a warm mess to soak into crisp bread, it’s a savory comfort of sublime proportions. It’s my kind of spinach dip — a little deconstructed, with pure and simple ingredients. You can even make the ricotta yourself, if you have some milk and cheesecloth to spare. And if anyone has gardened last season, you might notice the overwintered spinach is still springing from the dirt, and has taken on new depths of flavor from withstanding the frost. That’s right, they call this winter spinach, the kind that’s dug from the ground after it’s warmed over in the spring. It’s desirable amongst chefs for its markedly sweeter taste. It might appear a bit raggedly, and its leaves will be deep-green and thicker than back in the fall, almost like a succulent plant. 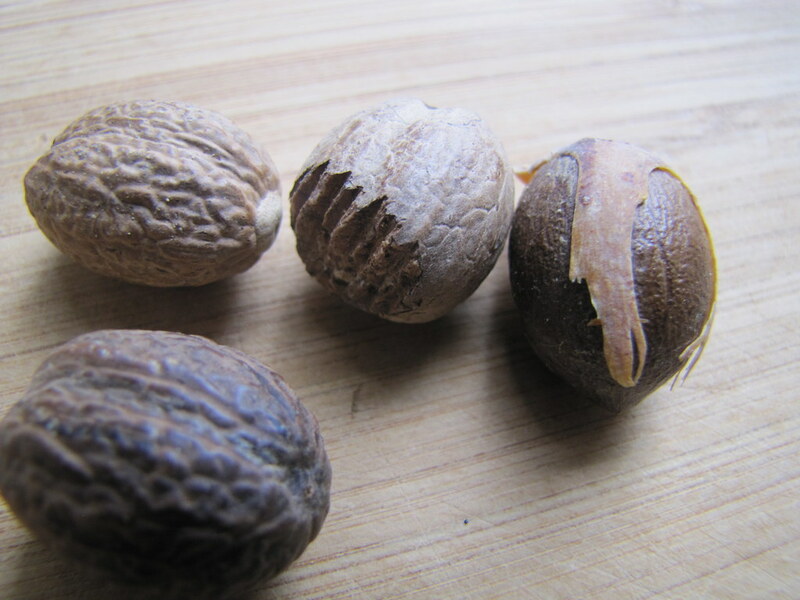 But those that make it this far into the season are special treats, and they’re available still in New York City’s Greenmarkets, where I picked up my very sizable bunch. 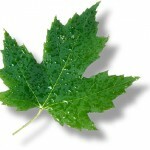 It’s great for cooking with, although if you can find very intact-looking leaves, go ahead with a fresh salad. 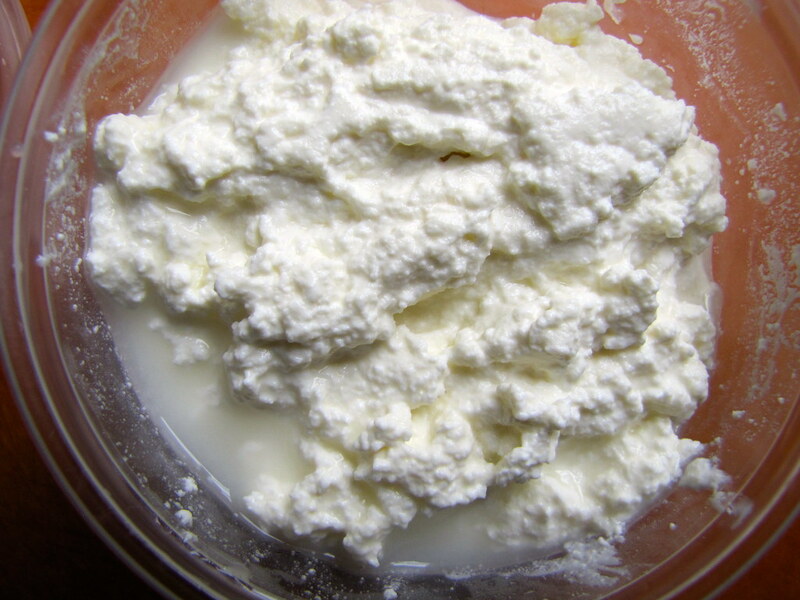 I decided to try out a pint of farm-made ricotta from Vermont, too, and the idea of baking something warm and luscious just called to me. 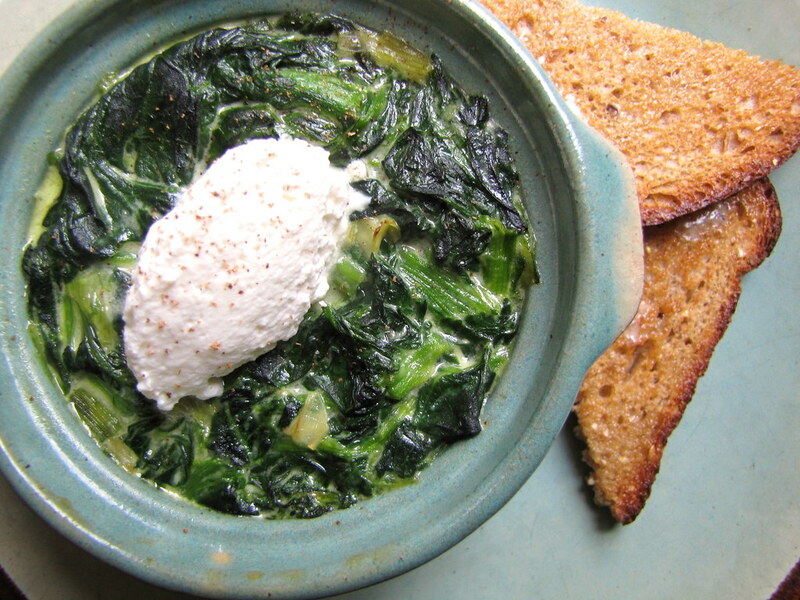 I’d originally planned to bake or poach an egg into the center of the warm spinach and ricotta mixture, for extra moisture and richness. But after tasting the ricotta leftover on my spoon, I decided to go whole hog with that ingredient alone. Fresh, creamy, good ricotta deserves a spotlight. And since it was unpasteurized, well, it would go bad in my fridge soon. Once the ramekin was baked so that the spinach was ultra-tender I plopped another dollop of cold ricotta on top, for some cool contrast. The cheese began melting into the warm mixture immediately. A little shaving of nutmeg on top of that lent a nice contrast, accenting the subtle sweetness of both the cheese and spinach. Stack up your toasts for this one — you’ll want to dig in. 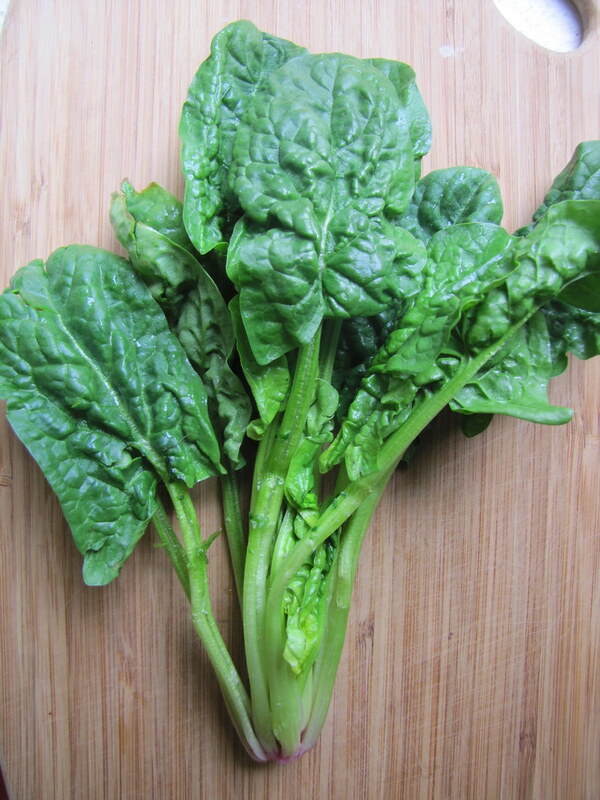 Get it while it’s warm, and you’ll have eaten a great pile of healthy spinach in one blissful sitting. Preheat oven to 375 degrees. 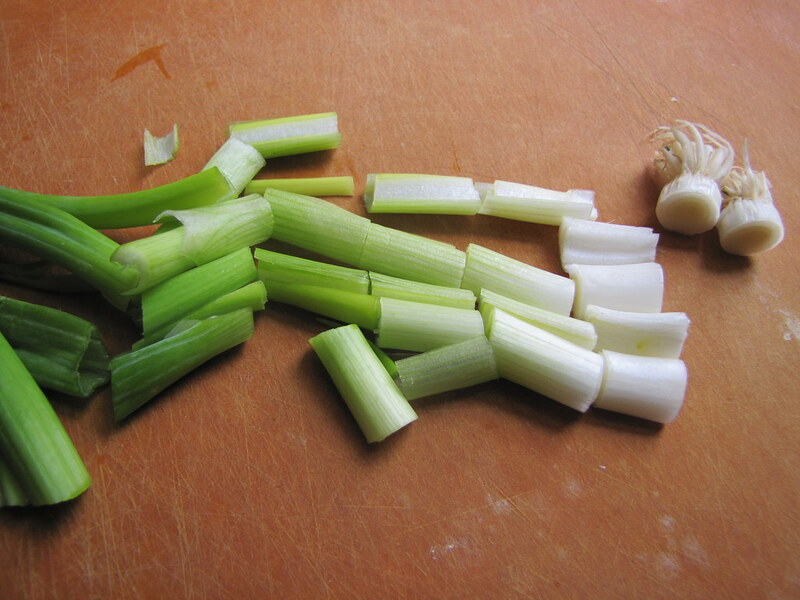 Heat the olive oil over medium-low heat in a saucepan and add the chopped scallions or leeks. Season with salt and pepper and cook, stirring, until softened, about 5 minutes. 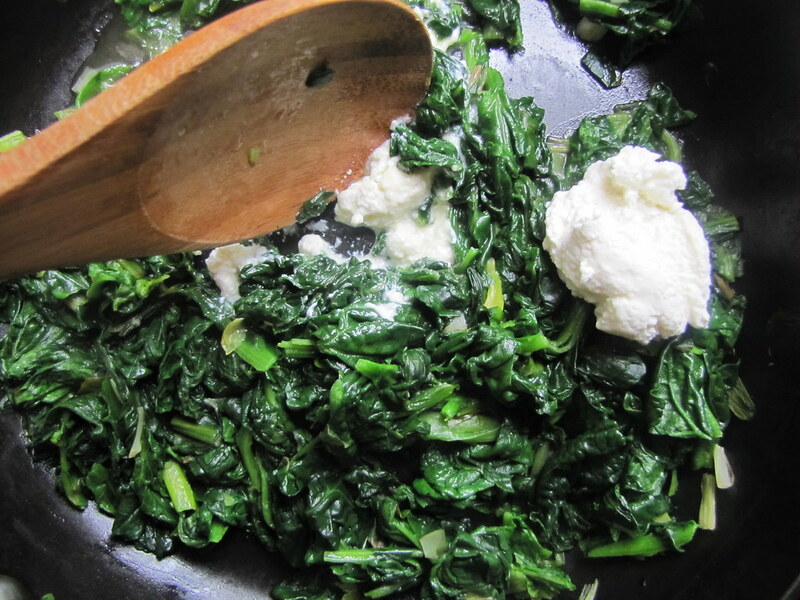 Tear or coarsely chop all the spinach leaves and add to the pan. Let them cook down, stirring occasionally, for 3-4 more minutes or until all the liquids have been drawn out and the pan begins to dry out. Season with salt to taste. Stir in one tablespoon of the ricotta and remove from heat. 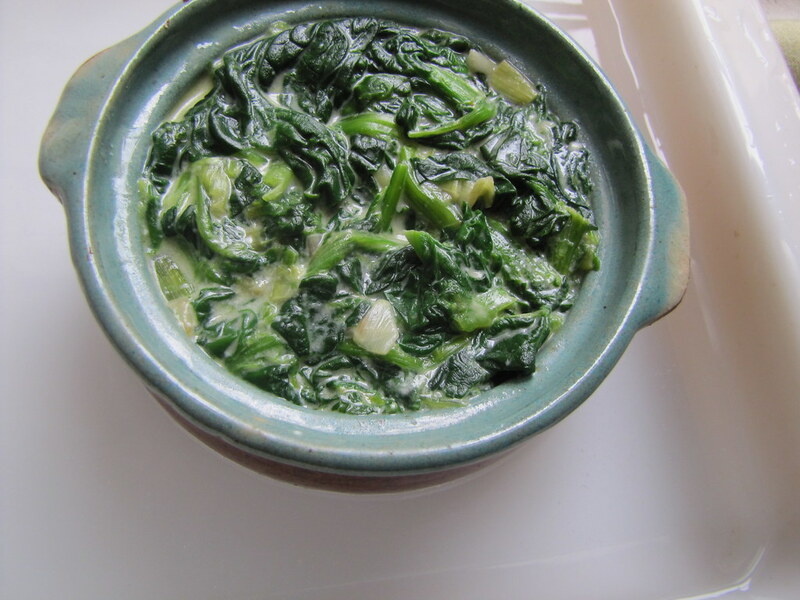 Pour the spinach mixture into a small baking dish, or large ramekin (or two small ramekins). Place in a casserole or loaf pan and fill it with hot water so that it reaches at least half the height of the ramekins. Place in the oven and let cook for 20-25 minutes. Remove and carefully lift the ramekins from the hot water bath using hot mitts. Spoon the remaining 1 tablespoon ricotta on top of each, and top with a sprinkle of the grated nutmeg. Serve with the toast. Three brownie points: So rich and so satisfying, yet so healthy and nutrient-dense. 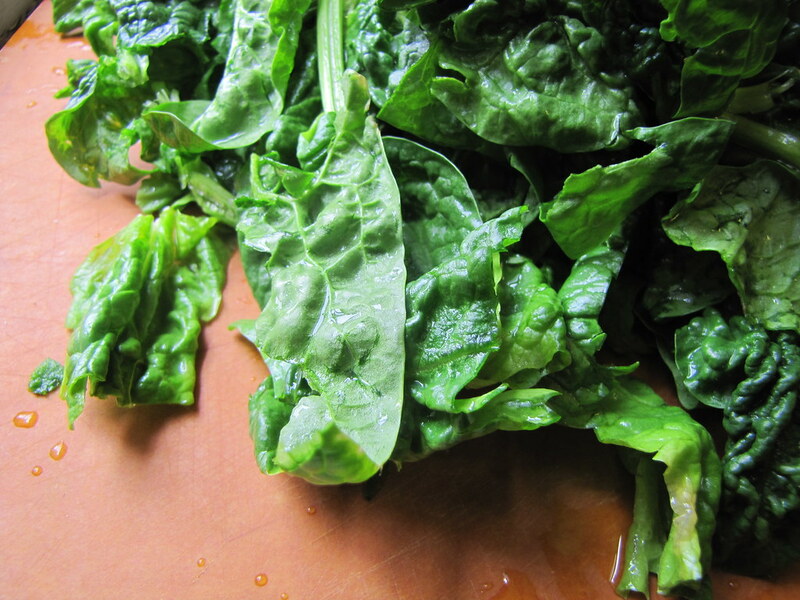 You’ll be getting a huge serving of the superfood spinach with this easy snack or light meal, and that’s a wallop of Vitamin K, Vitamin C, Vitamin A, Vitamin E, iron, fiber, potassium, calcium and so many more nutrients. Spring colds, begone! There’s also calcium and protein in the ricotta cheese, along with a bit of cholesterol, but with just two tablespoon for one large serving, it’s fairly minimal use of fats. Nine maple leaves: Here’s to using up the last stragglers from last harvest season, straight from the farm. This overwintered spinach was from New Jersey’s Phillips Farm, at many Greenmarket locations in NYC, and the similarly weathered-looking scallions from them as well. And the small-batch ricotta from a farm in Vermont that grazes its animals was a delicious alternate to conventional dairy’s version, which you can taste. What a lovely lunch. I adore saag paneer, so I’m sure your dish is very tasty. I just bought some whole wheat pita that would perfect for dipping into this. This sounds like heaven! Nutmeg certainly gives spinach a nice little lift. This looks like it would be a great luch, and maybe with a poached egg, it could be a light dinner or brunch. Extremely yummiful! I added a handful of shredded swiss to the baking dish before popping this into the oven. I served it with some toasted sourdough for my girlfriend and I for lunch and we were enraptured. I was so enchanted with it’s simplistic goodness that I came home and made it for the family that same night. Even my spinach-neutral family enjoyed. 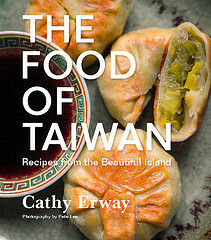 Brilliant, Cathy, and thanks!